Video tape, mixers, control desks, galleries, outside broadcasts, and all the other bits that go to make up the middle section in the transmission chain. 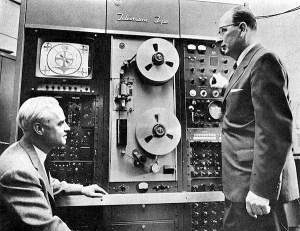 This is a late-50s publicity photo of an early VTR, the TRT-1B introduced by RCA in 1958. 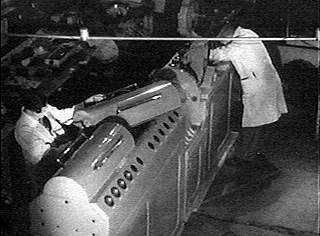 This machine operated only in monochrome, but another version was introduced at the same time for colour operation. This machine also had two more racks for power supplies, which were separate from the three-rack package shown and could be placed up to 27 feet away. The color version required one more rack of electronics, to be placed next to the three-rack package, and you had to find a place for a 21" color monitor which at the time was too wide to fit in a standard rack. Interestingly, RCA used the term "television tape" (as shown here) for some years, as "Videotape" was claimed by Ampex as a trademark. This is one of the early Baird telecine scanners; it is not clear whether this was for 35mm cine film or for the intermediate film technique which used 17.5mm film. 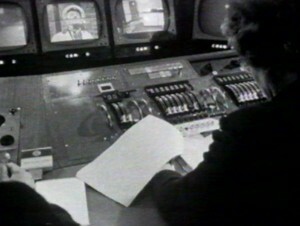 "switcher" rather than "mixer," as their equipment was always designed primarily to switch directly between video sources. flight and could be folded back against the belly when not in use. MPATI operated from 1961 until 1968, transmitting over about a 250-mile radius from over Montpelier, Indiana, near its home base at Purdue University. The programs were received by schools that normally had large, high-gain UHF antennas feeding downconverters that then provided VHF outputs to conventional receivers throughout the school; some schools received the service through local cable systems, and schools around Detroit got MPATI programming from a terrestrial relay site. 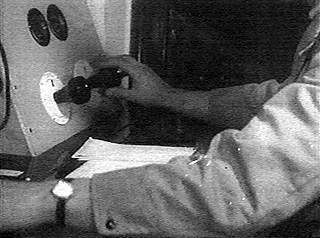 (At the time most home viewers either did not have UHF tuners or would have needed special antennas to receive the signals.) MPATI's taped programs were also shown on public TV stations in other parts of the U.S., and this continued well into the 1970s. Incidentally, several U.S. states now transmit one or more channels directly to schools by satellite, so MPATI could be considered to have been well before its time. 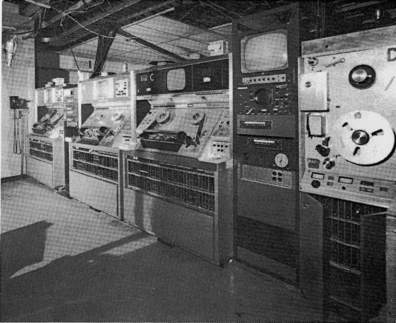 RCA 2-inch quad machines, date unknown, American installation. 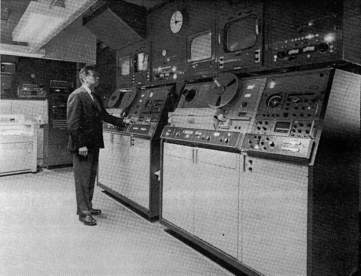 Ampex 2-inch quad machines, date unknown, American installation. The two VR-2000s and a VR-1000 in the background, place this photo after 1964. The two scopes -- one for waveform, the other a vector display for color monitoring -- are installed in an area where most VR-2000s had a B&W picture monitor. Until the early 1970s a color monitor had to be installed separately, as with these two machines; after Tektronix introduced its model 650 12" Trinitron monitor, that unit was "built into" many later VTR consoles replacing the B&W monitor entirely. 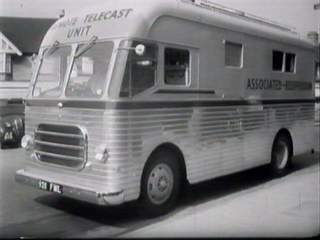 Associated Rediffusion's first "Remote Telecast Unit", or OB truck as they are now known. Same unit, rear view. 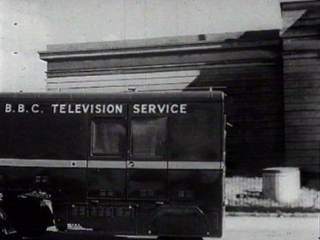 Both of these images date from 1955, and were used in promotional trailers for the new ITV service, advising the public of the exciting things that could be seen on ITV. 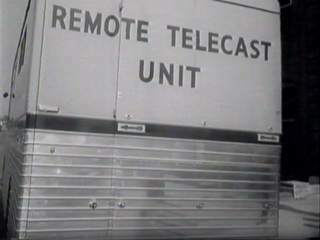 The use of these units would bring the action live to the viewers. 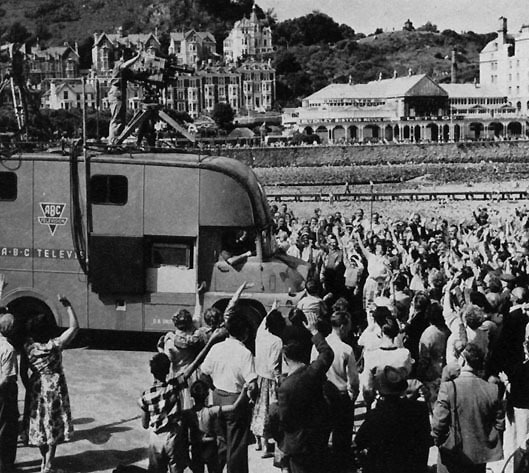 A BBC outside broadcast van from the late fifties. 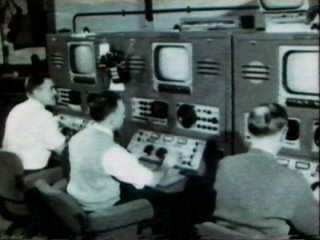 Vision mixers from Scottish Television in 1960. 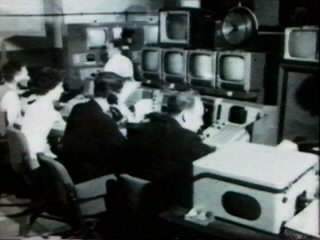 The nature of the ITV network of the sixties meant that there was frequent switching of circuits as programmes were sourced from different centres. It was a labour intensive task ensuring everything went to plan. 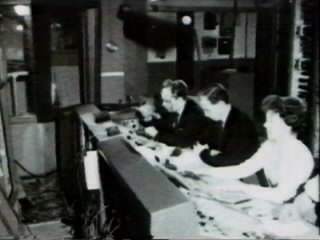 The transmission control room from Scottish ITV in 1960. Same control room, from the opposite view. The documentary this comes from describe how it is mainly young men who can think quickly who work here. 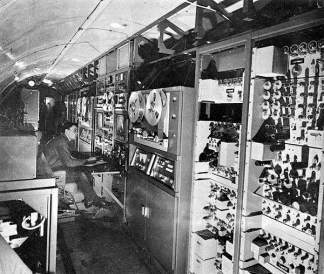 BBC Control Gallery / mixer used during the recording of Z Cars in the late sixties. 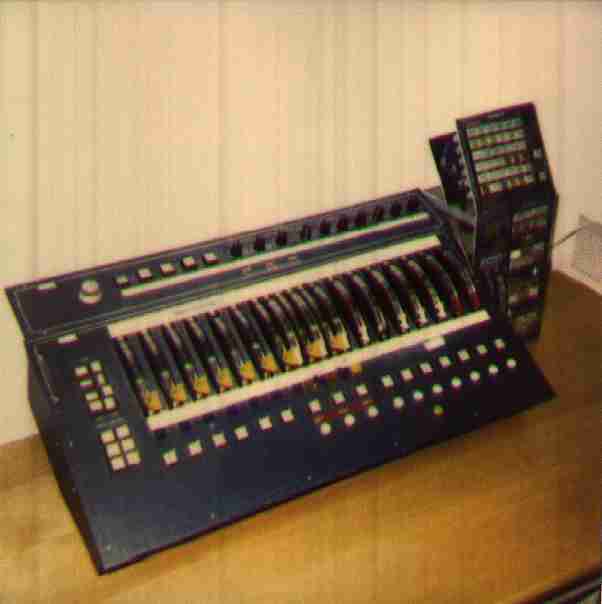 BBC NC1 Continuity Mixer (1980s), rescued from the BBC by Greg Taylor, but later lost. Have you seen this in a skip near you? The view of a mid-eighties Channel 4 presentation computer, on a Friday night by the looks of the line up. It is called "Ident" and it was sent via teletext with the CH4 signal to the ITV companies telling them how long to the next advert break. 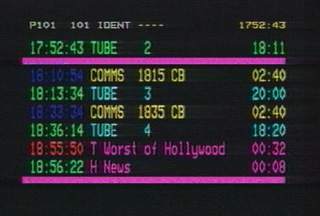 It never appears on air of course because the domestic teletext signal replaces it. The system was also used by BBC World. Thanks to Ed Ellers, Dicky Howett, Greg Taylor, Michael Coop, Gareth Randall and anyone I've forgotten who supplied the words and pictures for this feature.